Under Huggett's direction the playing is intimate, stylish, crisp and clean without being fussy. The sense of ensemble is impressive, like band and organist and conductor were one brain, one thought, one hand. 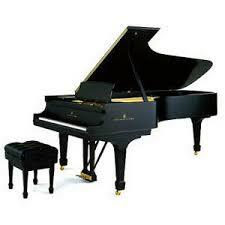 Halls' playing is brilliant, and his improvisations natural and assured, by turns moving and spritely. 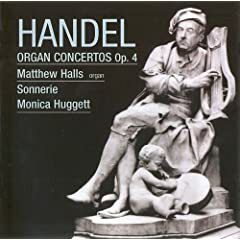 I've heard a lot of recordings of Handel's organ concertos, but to my mind this is the best I've ever heard since Ton Koopman traversed the literature long ago on discs that are next to impossible to find now. I can't wait for the release of Op. 7. The English conductor, harpsichordist and organist, Matthew Halls, was educated at Oxford University. Having initially established his reputation as a keyboard player, Matthew Halls has worked extensively with many of Europe’s foremost early music groups and in opera houses including The Netherlands Opera, Bayerische Staatsoper, Komische Oper Berlin, as well as at venues such as The Megaron, Athens, Lincoln Center, New York and Wiener Festwochen. In recent years he has been a member of the Amsterdam Baroque Orchestra. He was temporarily appointed director of The King’s Consort from June 2007 to May 2009. He has recorded numerous CD's as a continuo player and soloist. He has also performed with Baroque orchestras including Les Arts Florissants and The Orchestra of the Age of Enlightenment. Together with violinist Monica Huggett, Matthew Halls makes up the core of the chamber music ensemble. Matthew Halls has established himself as one of today’s leading young conductors. Hall has appeared as a guest conductor with both Baroque ensembles (The English Concert, Portland Baroque Orchestra) and with modern orchestras (Rundfunk Sinfonieorchester Berlin, London Mozart Players). He has conducted in such prominent venues as Het Concertgebouw, Amsterdam; La Cité de la Musique, Paris; the Konzerthaus, Berlin; and at the Palais des Beaux Arts, Brussels. Beyond the early repertoire for which he has initially become known, Halls is known for his passion for the Germanic repertoire, particularly Beethoven, Johannes Brahms, Schumann and Schubert. As a conductor of choral music he has conducted an eclectic cross section of the repertoire, juxtaposing composers as diverse as Byrd and Benjamin Britten, Gesualdo and Arnold Schoenberg. Matthew Halls is now firmly established as a conductor of international repute, having made significant debuts with orchestras such as Rundfunk Sinfonieorchester Berlin, Hessischer Rundfunk Sinfonie Orchester, Norrköping Sinfonieorchester, Orchestre Philharmonique de Monte Carlo and the London Mozart Players. Halls’ debut with the Scottish Chamber Orchestra early in the 2008-2009 season led to an immediate reinvitation to conduct the final concert of the Edinburgh International Festival this year, whilst his debuts at Handelfestspiele Halle and Central City Opera Colorado also resulted in immediate reinvitations, the latter to conduct a production of Puccini’s Madame Butterfly. Forthcoming orchestral engagements include concerts with the Netherlands Radio Philharmonic, Ulster Orchestra, Iceland Symphony, Hamburger Symphoniker and Les Violons du Roy. In May 2009, Matthew Halls conducted the much anticipated inaugural performance of the exciting new group, Retrospect Ensemble, of which he is Artistic Director. The launch concert, a performance of Georg Frideric Handel’s oratorio Jephtha at the opening night of the Norfolk and Norwich Festival, was closely followed by the ensemble’s debut at the Edinburgh International Festival, performing a programme of Bach cantatas with soprano Carolyn Sampson. Future plans include their debut at the Dresdner Musikfestspiele, tours of Europe and to the Far East, an annual series at Wigmore Hall, (which will form the backbone of their concert diary) and a recording agreement with the innovative Linn Records. Matthew Halls has a long established pedigree in the opera house. Having become known as one of the leading chorus masters in Europe, he has subsequently conducted a wide range of repertoire with companies such as English Touring Opera, New Chamber Opera and Amsterdam Bach Festival. Last season he conducted the UK premiere of Georg Benda’s opera-singspiel Romeo and Juliet in conjunction with Bampton Classical Opera and London Mozart Players. His operatic repertoire naturally covers all the Renaissance, Baroque and Classical works, but also extends to a wide range of much later repertoire, with a particular focus on the Italian Bel Canto and the B. Britten operas. His association with both The Netherlands Opera and Nationale Reisopera Holland have included productions of Verdi's Luisa Miller, B. Britten's Peter Grimes and Bellini's Norma, as well as G.F. Handel’s Hercules, Samson, Solomon and Saul. Matthew Halls remains very active as a harpsichordist, with Bach recitals at venues across the UK, including the South Bank Centre and Wigmore Hall, and performances including the Goldberg Variations (BWV 988) as far afield as Israel, Ottawa, Quebec City and Moscow. Following his studies, Matthew Halls joined the teaching faculty of the Oxford University for five years. Passionately committed to education and working with young musicians, the development of Retrospect Ensemble’s Young Artist Programme has been a priority for him. Matthew is also a tutor for the European Union Baroque Orchestra and regularly teaches on summer schools and courses such as the Jerusalem Early Music Workshop and the Dartington International Summer School. The Simon Preston/Trevor Pinnock recordings of the Handel organ concertos (Archiv) have served me well for years, but I'm ready to hear and possibly acquire some new recordings of these works. Thanks for the recommendation. The Retrospect Ensemble isn't exactly new. It is the name adopted by the trustees of the former King's Consort after its founder Robert King was released from prison last year and has since reclaimed the original name. King claims he is going to reorganize the Kings Consort, but it is undestandable if many of the players do not want to rejoin him. Corylss, the Menuhin/Preston version on a very inexpensive EMI Triples is a good investment. Are you familiar with it? Plenty of life in this recording and worth getting for the price, my friend. Thank you for making me aware of your recommendation. I will check it out. How do any of these new organ concerto recordings compare to those E. Power Biggs did for Columbia/Sony Classical? Another set I thoroughly enjoyed were those performed by Marie-Claire Alain with Paillard conducting [American Decca]. Lance wrote: How do any of these new organ concerto recordings compare to those E. Power Biggs did for Columbia/Sony Classical? Another set I thoroughly enjoyed were those performed by Marie-Claire Alain with Paillard conducting [American Decca]. You have to anesthetize me first. stenka razin wrote: Corylss, the Menuhin/Preston version on a very inexpensive EMI Triples is a good investment. Are you familiar with it? Plenty of life in this recording and worth getting for the price, my friend. Yes, this is the recording I have, too. Sound and interpretations are first-rate. I love the recent (2007) version of this opus IV, by Lorenzo Ghielmi with the Divina Armonia Ensemble. It is very, very beautiful. The quality of the recording is also amazing. Say what you will ... Biggs AND Fox did much to enhance the love of organ music to a generation that might not have otherwise ever taken an interest in organ music, especial that of JSB. Biggs, of course, traveled the world recording on very special and historical organs. He has left quite an incredible legacy. Biggs was also a scholar of the highest order and garnered quite a reputation during his lifetime. Have you heard the Biggs recordings of the Handel organ concerti? Lance wrote: Have you heard the Biggs recordings of the Handel organ concerti?